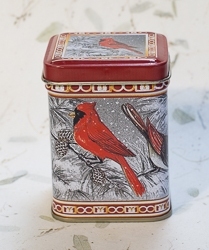 Holiday red cardinal motif candle tin is beautiful and decorative. Candle has a slight fragrance. Approx. 3" tall by 2 1/4" square.